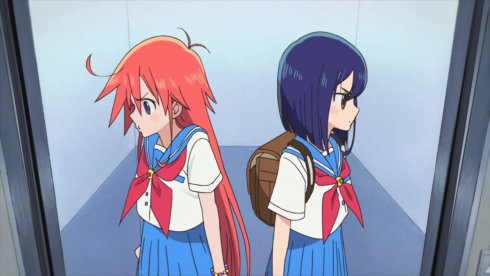 Flip Flappers‘s titles are usually spot-on, and the “Pure Mute” this week is no exception, as the absence of communication–both speaking and listening–plays a major role in our characters’ stories. 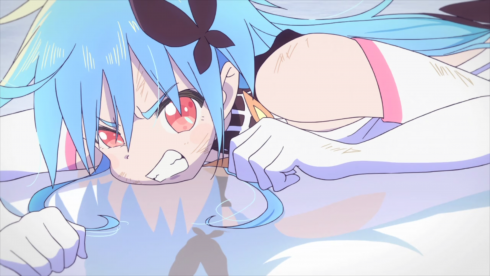 Papika and Cocona struggle to understand each other because Papika doesn’t realize her memory is muddled and Cocona can’t find the words to explain why she’s angry. No one likes to be confused for someone else, especially another partner, and especially when your sense of self is as tenuous as Cocona’s. After episodes of uncertainty, Cocona now knows how she feels about Papika, but she’s suddenly unsure how Papika feels about her. How can you ever be truly sure how someone else feels about you, anyway? 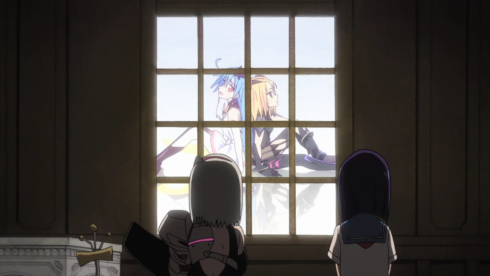 Pure Illusion takes this uncertainty and (as usual) gives it form, trapping Cocona in a room where she watches Papika and Yayaka through a soundless window. With Papika now literally muted, Cocona has to guess and infer, and she’s led astray by those who claim to know more than she does (Yuyu lies about what Papika’s saying to unnerve her). It’s a smart, succinct representation of young relationships, and the anxiety of wondering how someone else feels and if you’re as important to them as they are to you. 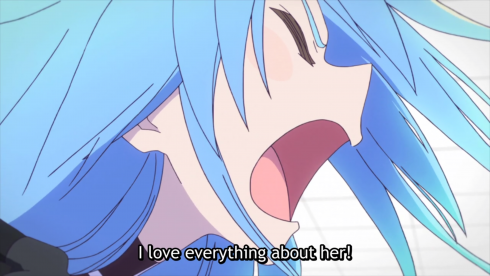 It’s also ultimately a positive representation, because Papika’s feelings and words do eventually reach Cocona, even if her voice can’t. 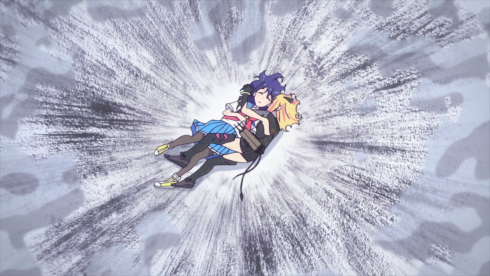 Once Cocona realizes that Papika is calling her name, risking her life to get to her, Cocona doesn’t hesitate to call back. And simple as that, the glass shatters, and the girls are together again. 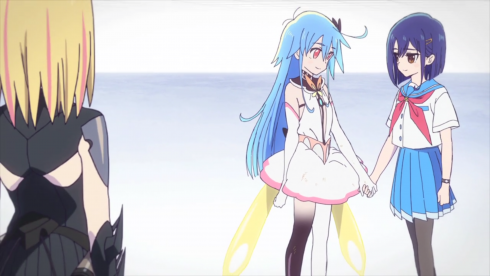 Papika’s fractured memories will continue to be a major conflict, as the end of the episode promises us, but for now, at least, Cocona believes in Papika’s devotion to her, too. 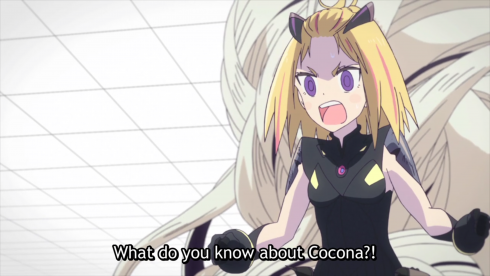 Yayaka’s hit her own “mute” button, as we learn through flashbacks that she’s been keeping secrets from Cocona since the day they met. She’s been with Asclepius for years, and they ordered her to befriend Cocona and keep an eye on her. Over time, though, that manufactured friendship became a real one, and the lie turned into truth. 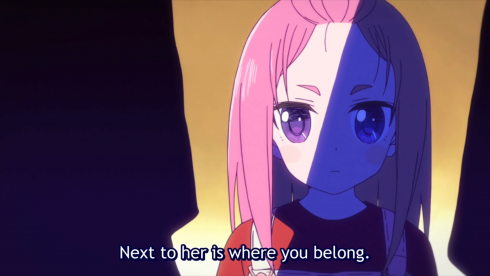 Despite her insistence that she has “a different mindset” from Cocona and Papika, all of her actions are driven by emotional rather than rational reasons: Yayaka desperately wants “a place to belong,” and she found that place next to Cocona. Now (as she sees it) her position has been threatened by Papika. She risks losing either her place in Asclepius, or her place by Cocona’s side, or possibly both. 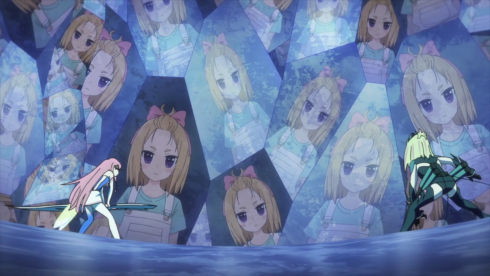 Trapped between duty and affection, Yayaka tries to shatter her happy memories with Cocona, and nearly succeeds. But not quite. In the end, Yayaka is more like Cocona and Papika than she is the twins. Her love for Cocona is stronger than her loyalty to Asclepius, and while that love saves Cocona, it nearly spells Yayaka’s end. On that note, what do they mean when they talk about “mindsets,” and how does Asclepius differ from FlipFlap? We might be able to find some clues in the name. I mentioned way back in Episodes 2-3 that Asclepius was the Greek God of Healing, and given that Yayaka and Cocona meet in a hospital (and Cocona is apparently undergoing some very odd, invasive “tests”), I think that’s still a valid reading. But Crunchyroll’s Peter Fobian also clued me into an allusion I’d missed: There’s another Asclepius, this one a disciple of Hermes Trismegistus, founder of the philosophy/religion of Hermeticism. He’s even got a text named after him: The Perfect Sermon, or Asclepius. I fell down a(nother) research rabbit hole and there’s a whole lot to dig through here, so don’t be surprised if we come back to it at some point, but for now I want to focus on two main points. First, the concept summarized by the maxim “As above, so below,” which refers to the idea that the microcosm (the self) is the same as the macrocosm (the universe). All is One, and to know one is to know the other. This is similar to the way Pure Illusion interacts with the real world. It’s also a bit like the perpetual cycle of perceiving-and-affecting that makes up Uexkull’s umwelt, except that the umwelt focuses more on each organism having its own unique, internal reality, while hermeticism believes in a single, ultimate reality. So it may be that Asclepius is more interested in absolute truth and Oneness while FlipFlap is more interested in relative truth and individuality. The more noticeable difference, though, is that hermeticism focuses on understanding and reasoning–on knowing or becoming one with God through “rational faith,” and by denying the material world (including bodily pleasures). The Twins are beings of Pure Reason, occasionally curious but ultimately dispassionate, focused on their job of collecting amorphous with no goals beyond that. 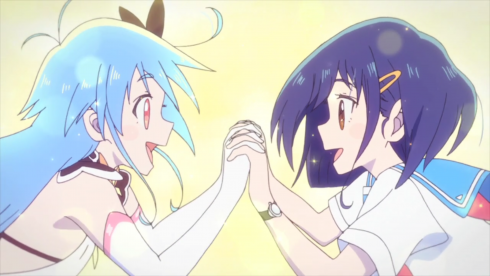 Compare them to FlipFlap, who expressly encourage Cocona and Papika to fulfill personal desires (“wishes”), build an emotional bond, and synchronize their feelings to grow stronger. When Yayaka claims she has a “different mindset,” and when she’s embarrassed to shout “Flip Flapping” with the others, it’s because she’s trying to be the distant and logical soldier that Asclepius wants. 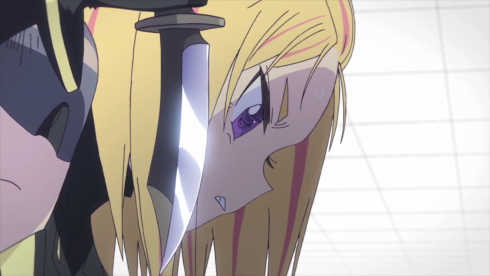 That she’s able to FlipFlap with the girls and that she ultimately can’t cut the amorphous out of Cocona proves that she isn’t–that she’s a creature of emotion, not reason, and therefore “not needed” by Asclepius anymore. That said, I still don’t think Flip Flappers is purely a “Long Live Animal Instinct” kind of show. 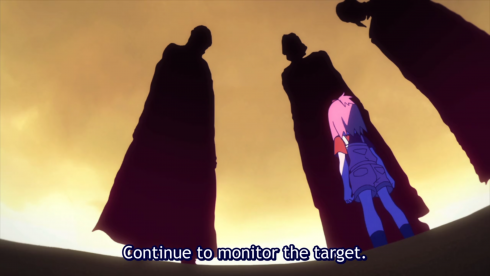 Papika has also been learning how to be more considerate, and this week she demonstrates at least some level of planning and big-picture thinking when she’s hungry but manages to keep the amorphous from Yayaka. There’s got to be a balance between the Twins and Papika; between Asclepius’s cold Reason and FlipFlap’s raw Emotion. 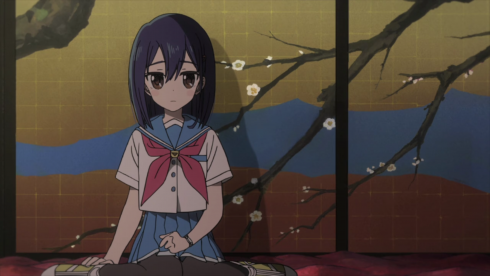 Cocona seems closest to achieving that balance…but first she’ll have to deal with Yayaka’s battered body and Papika’s fractured memories. No problem, right? Now that I know Hidaka is running out of spare parts, I find myself VERY CONCERNED when Bu-chan gets bludgeoned. Talk about a shift in perspective. 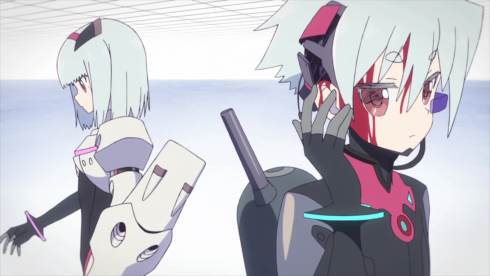 I’d have to check, but I think this was the first time we’ve seen actual blood in Pure Illusion. It speaks to the way the two worlds are slowly colliding, as reality creeps in and consequences become more noticeable–and more dire. 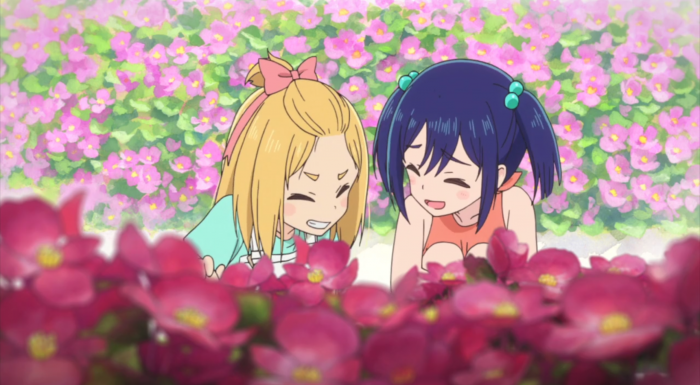 I love that Cocona’s two closest relationships are founded on breaking the rules. She’s always been a secret rebel. Folks sure seem to like mixing Hermes and Asclepius together, as both the Rod of Asclepius and the Caduceus (Hermes’s rod) are used somewhat interchangeably as the symbol of medicine, especially in the U.S. I have no idea how much of this the creative team knew and how much they just threw in because it looked cool, but it does sort of tie into the show’s focus on using familiar structures/genres to tell new stories, and how Cocona and Mimi are converging in Papika’s memory. 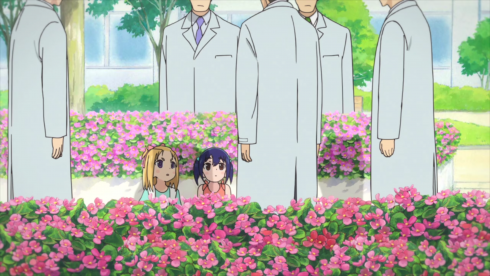 Pure Speculation: Given the amorphous embedded in Cocona’s thigh and Asclepius’s interest in her, I wonder if she wasn’t an early attempt at an amorphous child? It would help explain her ill-defined, unfocused personality in the beginning, and give us another layer to her personal journey: She’s not only discovering herself, but breaking free from a mindset literally implanted in her by others.